You don’t have to be a tourist to soak up Hollywood’s glitz, glamour and hotspots. Insider celebrity gossip and behind-the-scenes outings to famous L.A.-area landmarks are fun and informative for anyone, even locals. The following sightseeing tour companies offer interactive ways to experience L.A. from a new perspective. Tour costs are listed but can vary depending on promotions. 6126 Hollywood Blvd., Los Angeles, CA 90028, 800-619-2795, www.latvtours.com. Visit “Glee” and “90210” location sites with agent and tour guide Natasha Malinsky. A separate private tour for an “Entourage Sites Tour” (ages 18 and older) is available upon request. Wear comfy shoes and be ready for fun and action on the approximately four hour tours. While dishing out gossip and trivia, guides lead energetic outings that include T-shirt-decorating, dancing, and other show-themed activities. Glam up for your photo shoot on the “Glee Experience Tour,” which brings ages 5 and older to more than a dozen location spots. Activities include bowling and roller skating at the same venues as the actors. $99. On the “90210 Hotspots Tour,’ ages 11 and older visit more than 50 location spots, which include shopping opportunities. $89. Another Side of Los Angeles offers vehicle, boat and helicopter tours – plus more. Among them is Segway Tours where riders10 and older can zip around downtown Los Angeles, Hollywood, Santa Monica and Venice. 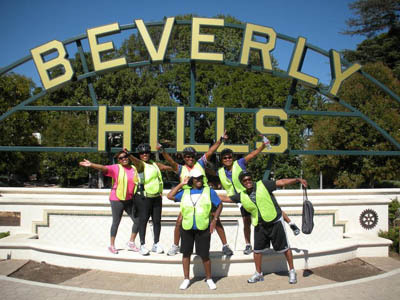 Most popular is the Beverly Hills Segway Tour. Here, you’ll scoot along trendy Robertson Avenue with its chic boutiques and eateries, glamorous Rodeo Drive and by mansions. Segways have pouches to store personal items and water. Watch out for celebrity sightings! If you can pedal, you can ride an electric bike, utilizing an extra boost only when you need it. The two to three hour guided daily tours breeze through Santa Monica and Venice neighborhoods. Along the way, owner and storyteller Barb Wittels shares history and fun facts. Minimum age to ride is13. Cost: $59. Tours start at the Pedal or Not Santa Monica office. Go green with guided cycling and hiking tours for all abilities. You’ll see iconic and hidden L.A. sights close up in ways you can’t from inside a vehicle. Hiking tours, which typically meet at Griffith Park’s Commonwealth entrance (2649 North Commonwealth Avenue), begin on paved roads with spectacular views of downtown LA, Century City and the Observatory. Walk along a dirt fire road to the peak of Mount Hollywood for sensational views of the Hollywood sign. Afterward, head downhill using flashlights to the Greek Theatre. Soak up sun, culture and history while peddling on bike paths and alleyways in Santa Monica and Venice. 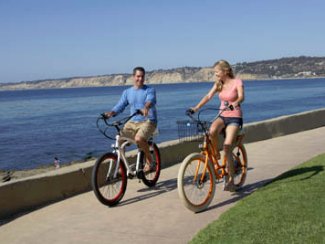 This two-hour, family-friendly bike tour makes frequent stops as your guide shares points of interest, such as Route 66’s final stop on the historic pier and the Marion Davies estate, a former playground for the rich and famous. Guides communicate with riders via headsets. Tour hours: 11.a.m – 4 p.m. The $35 per person rate includes bikes, helmets, children’s bike seats or carts, water and bike locks. Tours typically start at Blazing Saddles bike rentals on the Santa Monica Pier. Eat your way through L.A. neighborhoods with seasoned world travelers Matt Rubenstein and Trish Procetto. Enjoy specialty cupcakes, chicken, waffles and pastrami sandwiches on the “Hollywood Sites and Bites Tour,” which often include stops at celebrity chef-owned eateries. $99. 10 a.m. – 2 p.m. Wed. and Sat. Meet at the original Farmers Market at Third Street and Fairfax Avenue. The “Santa Monica Sites and Bites Food Tour” cruises through trendy Abbott Kinney, Main Street, Wilshire Boulevard and Montana Avenue. Cost: $105 adults, $69 ages 10 and younger.4 – 8 p.m. Thurs. and Sat. Meet at Santa Monica’s oldest brick building, at Second Street near Broadway. The Hop-on Hop-off service covers more than 50 stops from downtown L.A. to Santa Monica beaches, enabling riders to customize their outing. Enjoy open air viewing with an informative, narrated tour and a new free smart-phone “City Sightseeing” app featuring Hop-on Hop-off locations. The “TMZ Hollywood Tour – Secrets and Celebrity Hot Spots” tour stops at nightclubs, restaurants and other hip sites. Have your camera ready, you never know who and what you’ll see! The “Show & Save” program gives ticket holders significant discounts to museums, theme parks, bike rentals and other attractions. Examples: $9 off an adult ticket at Universal Studios Hollywood, $10 off Madame Tussauds Hollywood, and two-for-one admission at the Peterson Automotive Museum and Hammer Museum. The program also includes deals on Starline’s own original Movie Stars’ Homes Tour. Prices: $35 for a 24-hour, All-Route ticket; $50 for a 48-hour All-Route ticket. 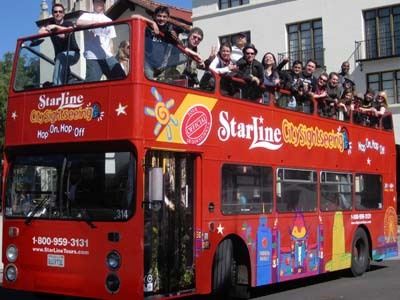 Buy tickets from the driver at any stop, at Starline Tours kiosks including the forecourt of Grauman’s Chinese Theatre or online. Two tours daily, 9:15 a.m. and 2:15 p.m. Call for reservations. Tours meet near the Kodak Theatre in Hollywood. Cost: 59 adults, $49 ages 3 – 10. Have your picture taken in front of the world-famous Hollywood sign overlooking Mulholland Drive and visit the filming locations of “Entourage.” Taking people sightseeing since 1981, L.A. City Tours transports guests around in one of two buses to scout out classic L.A. area sites. For more travel articles, follow Los Angeles Traveling Mom @mimitravelz. This makes me want to go to LA!